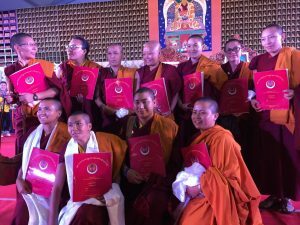 The Drikung Acharya Nuns Leadership Program is a year long fellowships for Tibetan Nuns from India providing skills for international leadership and future growth of Samtenling Nunnery and its graduates. Upon her return to India the fellow will design courses and workshops to share her skills. 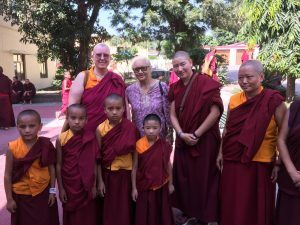 The program was developed by the Acharya nuns in conversation with an international team and is supervised by Mrs Taklha, former director of Samtenling Nunnery and Khenmo Drolma, Abbess of Vajra Dakini Nunnery. This program is designed to empower the 90 nuns of the Drikung Samtenling Nunnery. Like their brothers, the monks who serve internationally, they are essential as future leaders in the Drikung Kagyu lineage. The first year of the fellowship in the United States will contain beneficial studies, skill building and a major exploration of the full potential of the fellowship. Each fellowship year will focus on a project defined by the visiting nun with the team of experts to clearly define acquisition of skills that can affect both the younger nuns and the new graduates. Over time, the full population of the nunnery would benefit from the studies acquired during the fellowship. As the Acharya nuns assess current and future goals, we will tailor the program to prepare them with skills. Many of the challenges at Samtenling are also being faced by other monasteries and nunneries in India, thus the skills of the Fellow could have a very wide application. 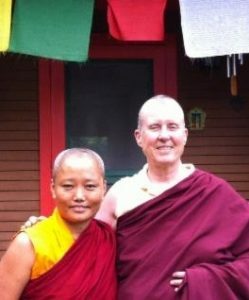 As the first Fellow in the Acharya Nuns Leadership program, Acharya Ani Yeshe will spend 4 to 6 months at Vajra Dakini Nunnery Samtenling’s affiliate in in Maine. She is an Acharya or graduate of the rigorous philosophy program at Samtenling. Currently she is on their teaching faculty, working with the youngest nuns. Arriving in August 2018, her work will begin at VDN’s Liberation House in Portland, Maine, where she will be immersed in English language education, assist in Dharma classes and interfaith activities and visit other nunneries as she refines her individual Fellowship project. This year, we will emphasize planning, team building working with interfaith groups and development of training modules. Following her residency in Maine, she will attend month long training modules in Florida, Iowa and New York. These modules will be coordinated by individual experts and or centers in various cities during her visit.